Since we ran our first article on ICFs (Insulated Concrete Forms) on this website last year, we've had a LOT of questions from contractors about what ICFs are, and how they can be used in renovation contracting and new homebuilding. Here's the article again, with some interesting posts underneath it, including one today from Gary Brown at Amvic System, a major Canadian ICF supplier. This article will expand on the various features and types of ICF’s in the market and will highlight the features of the first ever Canadian standard on ICF’s. As with any technology, the ICF form units have gone through many transformations as they adapt to the requirements and demands of the market. In the Canadian industry ICF’s have been around for over forty years. There are three essential types of ICF units. The blocks: The majority of the units are referred to as ‘blocks’. Blocks can vary in size and dimension ranging from a height of 16 inches to 18 inches with varying lengths of 48 inches to 96 inches. The blocks use an interlocking system, which is unique to each system, to connect the blocks together. Each block has an attachment surface that is in the form of a web which connects the pieces of expanded polystyrene together. These webs are formed in the middle of the insulation or in some cases extend to the edge of the block so that you can see it visually. Other web attachments are achieved by physically placing the webs at precut grooves as the wall is built. These types of web systems allow the contractor to visually see the web after the wall is constructed. Blocks that have embedded webs, provide an imprint or design to indicate where the construction crews should be attaching finishes into. One of the key points in con structing an ICF wall is that these imprints or webs line up for attachment purposes later. Web materials for ICF systems are generally plastic but some of the webs are steel. The ICF block units come in a variety of designs for shipping and handling purposes. Some of them are shipped as a complete block, so that they are already assembled when they are unloaded. Others ship the webs and insulation boards separated and they require assembly on the site. The webs are then inserted into preformed slots that have been molded into the insulation board. The intent of this is to minimize shipping charges. Two of the systems I will be describing later also use this method of shipping. Another design of ICF’s, allows for a foldable web for shipping purposes. The ICF form is then opened up at the jobsite for stacking and concrete placement. The demand for a broader selection of ICF units has resulted in the development of greater thicknesses of ICF systems. The standard is six inches but the thickness can range from four inches and up to what you require. Each manufacturer, depending on his block configuration achieves different thicknesses by either a larger block or an increased web size whether embedded or pieced together on site. Another feature of the block systems is the interior design of the forms. The current Canadian Building Code, only recognizes the ICF wall system that has a core of uniform thickness across the cross section. However there is a gird wall system, or waffle and a post and beam system which allow for higher insulation values due to the reduced concrete filling the form. The benefit is the higher insulation values but the challenge is designing the system structurally under Canadian Codes. In the U.S. they have prescriptive code requirements for these types of ICF wall systems that allow easier access through the code approval process. 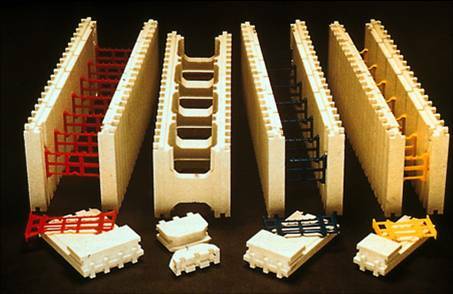 All ICF block systems have evolved and developed unique corner sections, brick ledge forms, wall junction sections, etc. in order to address constructability issues at the job site. The panels: The second most common ICF wall system is the panel type. This will consist of panels approximately 12 inches by 96 inches to 48 inches by 144 inches. The panels have flat edges versus the interlock of block units and are tied together with separate connectors or ties. These are assembled on site or prior to delivery to the job site. As with the block forms, the cavities can vary in thickness across the forms. The planks: The third type is similar to the plank type but is referred to as the panel type. These forms usually come in heights of eight inches to 12 inches and lengths of 48 inches to 96 inches. These are also site assembled. The major difference between plank or panel type and block is some manufacturers will just sell the ties and that leaves the contractor free to select his own expanded polystyrene panels that meet the ICF manufacturers’ criteria. Choosing your system: In selecting a system as a contractor, the question that is always asked is, which one should I choose? The final product is a cast-in-place insulated concrete wall, so the selection should be based on researching the ICF systems in the marketplace. The manufacturers all provide detailed information on their products and construction details. These should be reviewed to see if there is enough variety in addressing potential job site challenges. The network of manufacturers’ representatives is a key element in the support you will receive during your construction experience with ICF’s so check it out. The training sessions offered by the manufacturers, will give you a good indication of whether this is a company you can work with. The key to determining which ICF form system is right for you, is doing your background work before you take the plunge. Over the past couple of years an industry group of ten ICF manufacturers under the auspices of the Ready Mixed Concrete Association of Ontario has led the charge to develop the first Canadian ICF standard. This achievement was realized in February with a new National Standard CAN/ULC-S717.1-12 “STANDARD FOR FLAT WALL INSULATING CONCRETE FORM (ICF) UNITS”. This standard describes the requirements for the manufacture of ICF from units for ICF wall with a uniform cross section. Information and pricing can be obtained by calling John Wade at 613-755-2729, ext. 61426 or contacting him by email at: John.Wade@ul.com. This standard can be ordered for $193.00 CAN (Hardcopy) from the ULC website (www.ulc.ca) ULC online store. The fire performance of the ICF unit material falls within the scopes of documents published in the National Building Codes. The structural performance and the design and placement of the concrete within the ICF unit fall within the scopes of CSA Standards CSA A23.1/A23.2 and CAN/CSA A23.3 or ACI Standard ACI 318. This standard outlines the performance criteria for the expanded polystyrene board, testing requirements for both the steel and plastic webs. Dimensional tolerances and potential concrete loading on the webs are taken into account. The Appendices allow for the establishment and guidance of an ICF manufacturer quality control program. This standard has been proposed for adoption into the National Building Code of Canada for the 2015 NBC. The expression “ Comes of Age” is pertinent to the ICF industry. The codes and standards world and energy efficiency building code requirements have started demanding a level of performance that ICF systems can deliver in order, to make this place a greener world. Milwaukee Tool sponsors Canadian Contractor's RenoSummit business seminars, just six weeks away.